Greetings, dear readers! I hope this post finds you well and you've been having a great week so far! I am back home from Los Angeles after attending The Makeup Show this past weekend, and I'm getting back into my groove. I took a lot of photos, and while I am mostly done sorting, I still have to finish that up. I should have a post up about the show in the next day or two, but until then, how about a post showing my nails from the show? 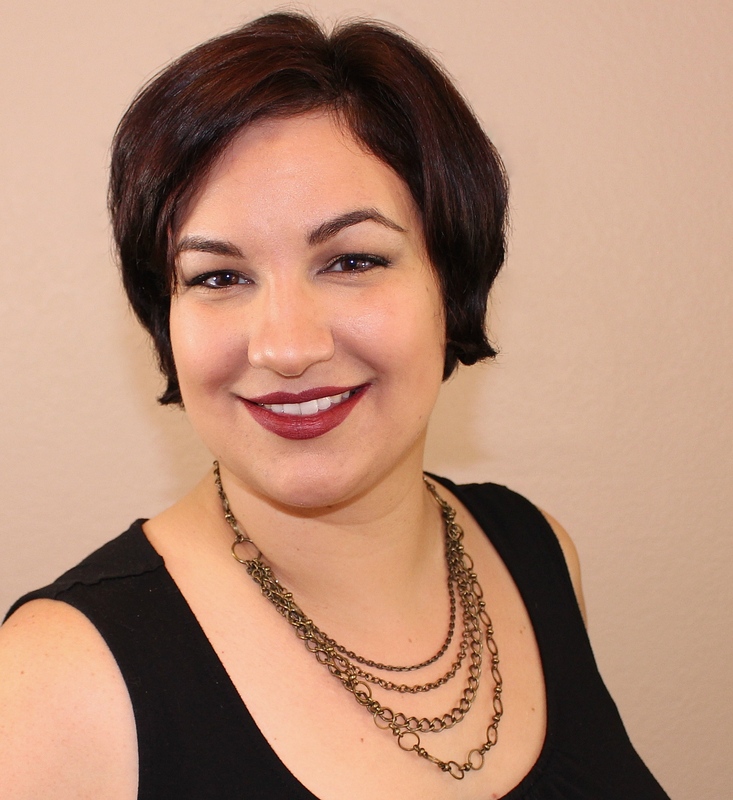 Literary Lacquers re-released her Edgar Allen Poe-inspired shade, Soul Within Me Burning last month along with the other two shades from The Raven trio. This polish coordinated so perfectly with the wardrobe I packed for the weekend. I naturally had to give it some love! 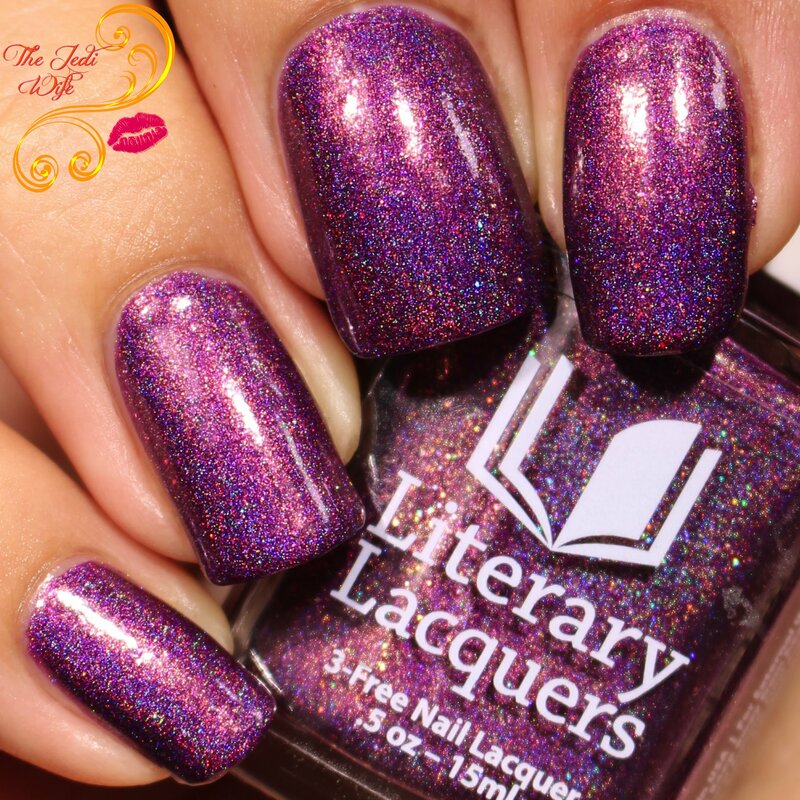 This dark warm purple holographic is filled with coppery orange sparkle and is such a fabulous shade for the season! 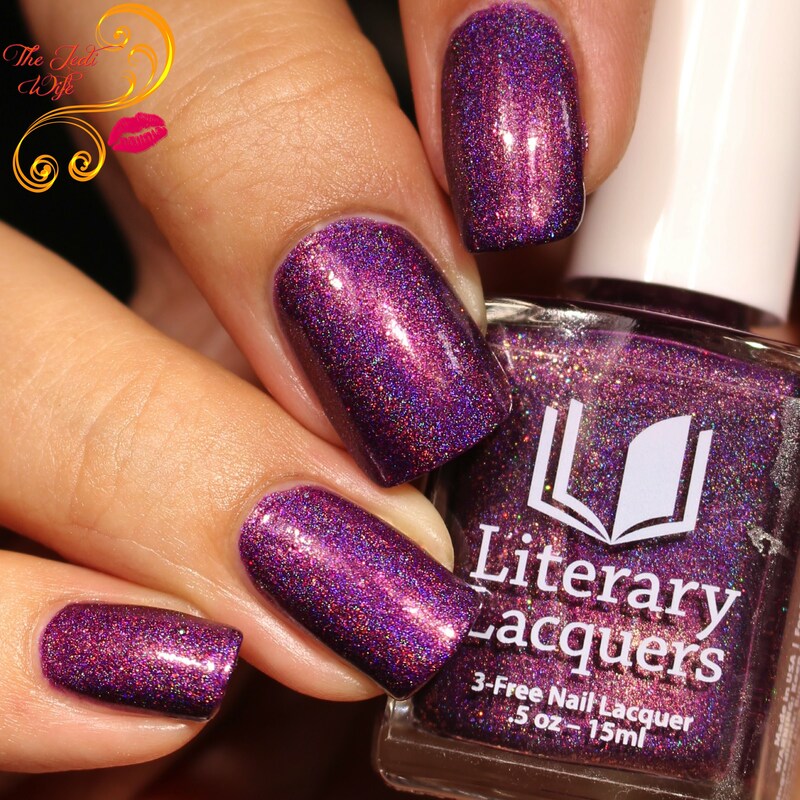 In true Literary Lacquers fashion, the formula was on point and I have no issues to report. I used two coats plus top coat for these photos. I am really loving this colour! I painted my nails Thursday evening and still have this beauty on my nails now! While I was hoping to do some nail art as well, time ran away from me Thursday, and with a very early flight the next morning, solid nails just had to do. That being said, Soul Within Me Burning is exquisite on its own, and I got so many compliments on it while at the show! If you've been wanting this shade or the others from The Raven trio, they are now back in the shop at Literary Lacquers. You'll definitely be glad you picked them up! This is all I have for today's post. Wish me luck that the little men are willing to cooperate for me so I can get my post together on The Makeup Show ASAP! It is such a pretty and elegant shade! I'd wear it! Yasssss that’s such a gorgeous!! It is an absolutely stunning shade! You captured it in the sun which really showcases all it's beauty! This is such a gorgeous shade. It's unique and pretty! Very pretty. I love sparkly colors, and the flecks with the deep purple are lovely. I just love this shade! It will be perfect for holiday parties. Such a dazzling berry holo! That polish is going to cause fights in my house! Both my daughters will go crazy for it! Fantastic shade! this polish looks so awesome, love the color and the glitter, the color is so unique and different. Oh wow that is such a gorgeous shade! I can't believe this is only two coats! I will have to check out this brand! Beautiful color, and I love this concept! Wow, such a beautiful color! Love all the different sparkles and they go so well with the purple. That looks amazing, it's only two coats but the result is great. I love how it looks like you have mini galaxies inside your fingernails. I am in love with this color. It will be perfect for the holidays. Sparkle is always my favorite. Loving the colors and the designs. Only two coats? So pretty! This is such an amazing shade! Not the usual pink and just somewhere in between.. Loved it!! Ohh, I can't believe this is only two coats. Looks very thick and super shiny. I love the shades too! I want to wear this in our upcoming party plus wearing the same color of my dress. I love the purple shade! My gf would definitely love this shade. Thanks for sharing! Wow!! Purple and lavender happen to be my favourite colours. This shade looks just perfect. To top it up, that shimmer is all you need to set the mood. I need to pick that for myself. Cheers!! That is such a gorgeous shade of purple. It is so sparkly too! Nail polish and lipstick has come a long way. There are so many bold shades. I have to get up the nerve to try them. That purple shimmery color is so pretty and so perfect for the holidays! Totally stunning. I would be in heaven wearing this shimmery purple. 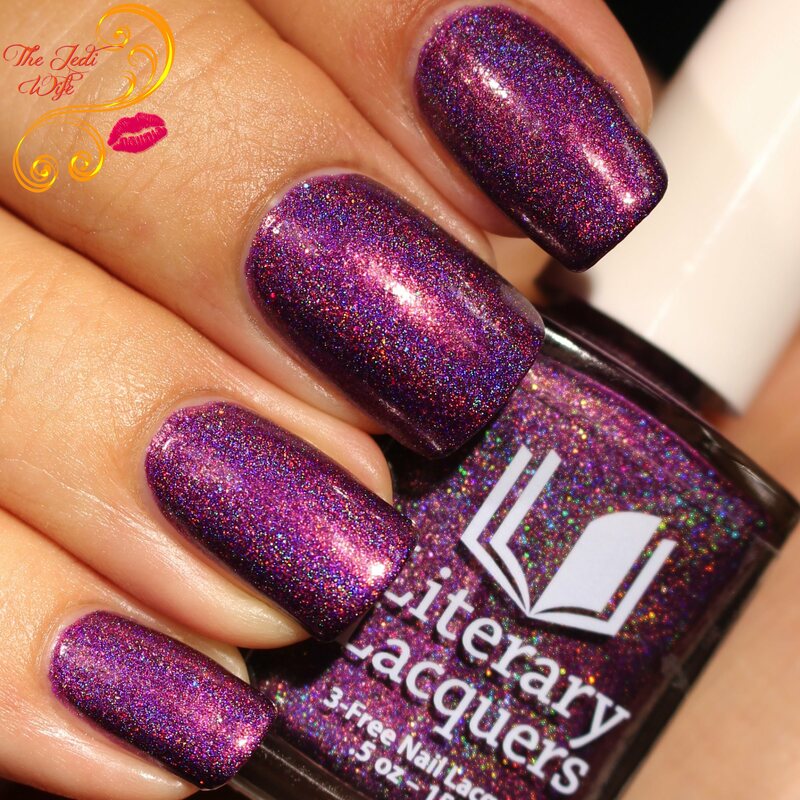 Literary Lacquers I have not used before but would love to try. This color purple with the orange and copper in it looks amazing with the metallic look to it. Thanks for sharing this awesome nail polish. I love the theme of this brand. So cute and also the glitter pigment looks amazing. This is so beautiful , I so love the color. Just not so sure I can pull it off on my nails.